They are huge and scary! The mod adds to the game falling meteorites five species! Ordinary meteorite - the meteorite small and medium size. Consists of coal, iron and lava. Ice meteorite - the meteorite consisting of snow and ice! Fire meteorite - the king of all meteorites! 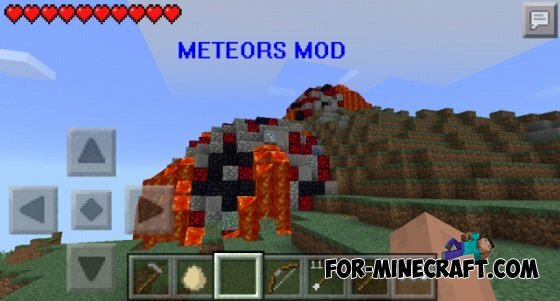 Consists of all ores and obsidian glowing! This is a huge and devastating meteor! Be careful! Glowing meteorite - a very rare, composed of luminous dust. / spawnmet - tired of waiting for a shooting star? Spawn it! Use this mod at your own risk! Do not use commands outside the house! The tiny town map for Minecraft PE 0.10.0This is a map with a small town for Minecraft PE 0.10.0 . If you are tired of huge maps, and you just want to have fun relax then this map you should like.